B. Thomas (Arlington, Texas, United States) on 8 May 2012 in Plant & Nature. 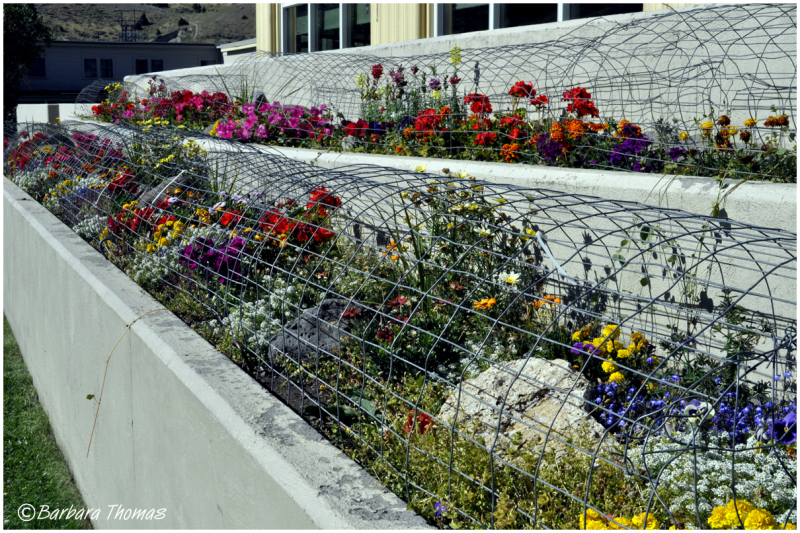 The flower gardens at Mammoth Hot Springs area in Yellowstone National Park had to be grown in "cages". Were they going to escape, you ask? No, they were there to protect them from being eaten by the elk which roam around the Mammoth Hot Springs village. In London, folks are fixing chains to their plants or setting them in concrete. It is not elk they worry about . . . 'Garden Theft' is the latest crime. LOL Barbara, I wondered if my dogs were running around there somewhere! Beautiful but a little sad that they must be jailed for their own protection. The cages to make an interesting difference in how we perceive the flowers. I can see the necessity though. Nice shot. I smile at this and know the reason for the cages, but surprised that it is my stompin ground. So much of what we grow has to have cages here, most trees, except juniper, Irises, Holly hocks and a few other things which I wonder why the deer don't care for them. @Joyce: Yep, practically in your back yard. Is that herd of elk still hanging around the Mammoth School? Another shot from your "neighborhood" coming up on Friday. Great framing ! Happy ST ! From seeing your title first, I thought, hey, it's silly Tuesday... but they really are in cages. How funny. Great find and beautiful flowers, I have never seen anything like this before. Great composition! A great PoV of these colorful flower beds to give this compo nice depth! I thought it was to prevent theft (first idea) :-)) Wonderful flowers and beautiful colors !!! Beautiful frame and composition. really image. Beautiful capture and colors!!! WOW!! Love this! = ( kinda sad...........plant prison. @Melissa: Sad, yes, but you made me laugh. how ingenious ... and frustrating - for the elk!